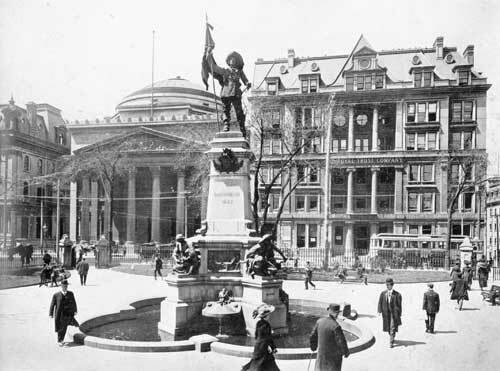 Place d'Armes c. 1910, Montreal. Right building is 107 St. James St (Royal Trust Company Building). Left building is 109 St. James St (Bank of Montreal Building), Modern day Rue St. Jacques. The Royal Trust Company, founded in 1899 , had its main office in Montreal and another in Toronto. In Montreal, it initially operated out of the basement of the Bank of Montreal building at 109 St. James Street (being associated with the Bank of Montreal). As of February 1908, the Company had purchased the Alliance Building next door at 107 St. James Street . In 1908-1909 they were listed in Lovell’s Directory at both 107 and 109 St. James Street, but in 1909-1910 they were listed at 107 exclusively. This photo taken by Anne M.E. Shill in 1957 shows the Royal Trust Building behind the Maisonneuve monument. The New York-based architectural firm McKim Mead and White designed and rebuilt the Royal Trust Building in 1912-1913. 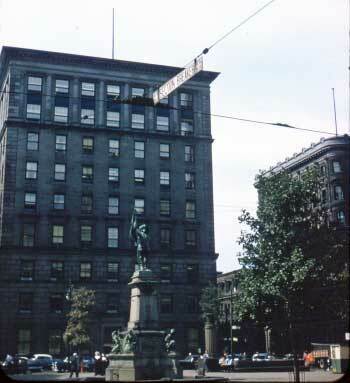 The Company`s office in Toronto was in the Bank of Montreal building on the corner of Yonge and Front Streets . According to an advert from 1902, the company had a charter to ‘act as trustee, executor, assignee, curator to insolvent estate, to give bonds in connection with any judicial proceedings, to act as transfer agent and registrar of shares, to manage sinking funds, to accept any financial agency, etc.’  The broad purpose of the trust company was to look after people’s financial affairs. These days, The Royal Trust Company is an affiliate of the Royal Bank of Canada (RBC) . Donald Alexander Smith, 1st Baron Strathcona and Mount Royal. He was the President of the Bank of Montreal and co-founded the Canadian Pacific Railway. He became the original President of the Royal Trust Company in 1899. Richard B. Angus, a banker and member of the Canadian Pacific Railway syndicate. Sir Hugh Montagu Allan, President of the Merchants Bank of Canada and son of Sir Hugh Allan, founder of Allan Shipping Line of Montreal. Sir William Christopher Macdonald, tobacco manufacturer and philanthropist who donated large sums of money to McGill University and started Macdonald College, originally intended for farmers. Sir William Cornelius Van Horne, former railway manager and President of the Canadian Pacific Railway. Sir Thomas. G. Shaughnessy, President of the Canadian Pacific Railway following Van Horne. E.B. Greenshields, dry goods merchant. *information about these men was largely taken from the online Dictionary of Canadian Biography.